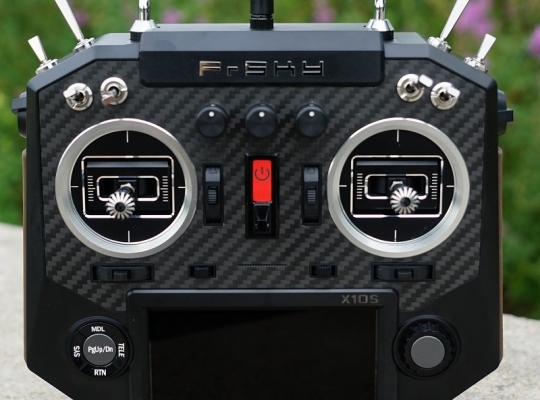 The FrSky Horus X10S and X10 are the latest transmitters to join the FrSky family. They both carry on all of the features of their predecessors, while each model has its own unique advantages. The X10 series is lighter than the X12S, and its good ergonomics mean it is vey comfortable to hold and hangs from the from the neck strap at the correct angle. The X10 and X10S have the built-in iXJT+ module, two internal antennas mounted at 45° operating in dual path diversity mode, or a 2dB detachable external antenna with antenna detection and SWR warning functions. They feature an industrial 480 x 272 TFT daylight readable colour LCD screen, the best in the business. The large screen and encoder wheel make navigation and programming significantly faster and easier than on an X9D. They come with FrSky’s own easy to use FrOS (operating system) and of course, support OpenTX as well. The X10 series also inherits the wireless trainer system. They have improved battery life with a 2600mAh Li-ion battery charged by an internal smart charger, giving a runtime of approximately 9hrs between charges. A JR style module bay is built into the back of the radio that can run different transmitting modules. The main difference between the X10 and X10S are the gimbals. The Horus X10 has M10 hall sensor gimbals with 4 ball bearings. 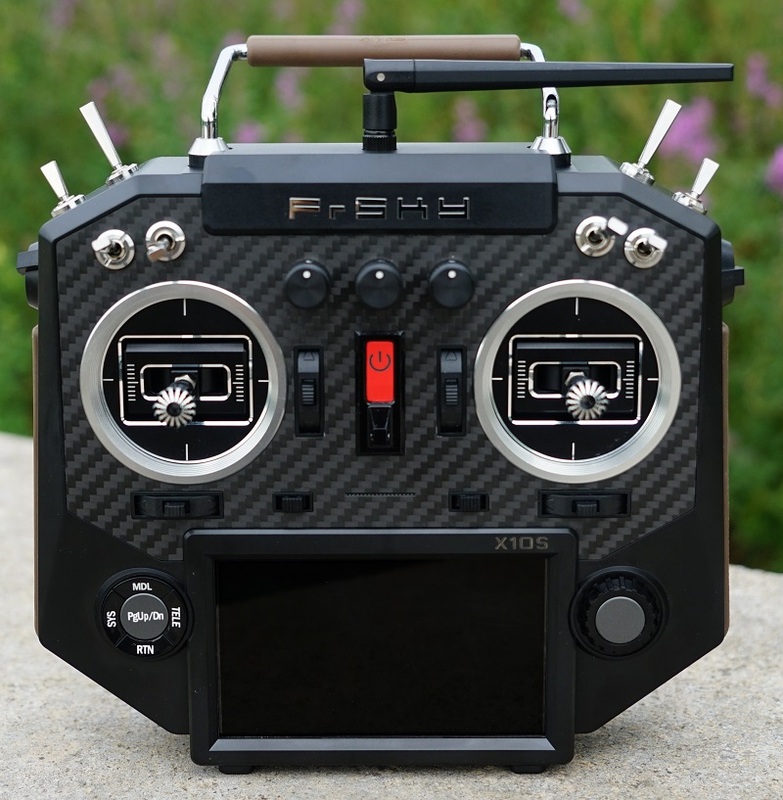 The Horus X10S is equipped with FrSky’s latest and best gimbal to date, the MC12 Plus which has all CNC metal frames and 10 ball bearings (4 on each axis plus 2 on the rocker arms). Additional precision comes from the new digital Hall Effect encoder system, making the gimbals more sensitive, and having a higher resolution which results in greater precision. Please note that our stock of X10S are supplied with LBT firmware. The Horus X10(S) transmitter makes use of FrSky's bidirectional "ACCST" (Advanced Continuous Channel Shifting Technology) communication system. This frequency hopping technology takes advantage of the entire 2.4GHz band resulting in excellent range and reliability. The most important aspect for any transmitter is maintaining a rock solid connection with the receiver. ACCST is perhaps the most reliable protocol on the market today. Being bidirectional means that as well as the transmitter controlling the receiver, data from the receiver can be sent to your transmitter. FrSky knows many things can affect the connection between Transmitter and receiver so RSSI (receiver signal strength indication) is incorporated into all telemetry receivers. The Horus transmitter is continually monitoring the reception quality at the aircraft. Horus will alert the pilot before signal quality becomes critical. This saves planes and makes the hobby much safer! 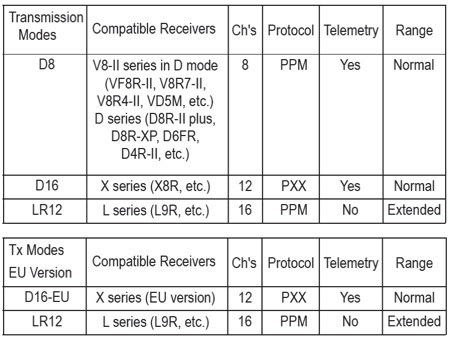 A protocol called PXX is used to produce super low latency between the transmitter and RF module. The Horus X10(S) has a large industrial high resolution color TFT screen (480 x 272), readable outdoors. Model data, music files, voice files and picture files can be stored on the SD card. The SD card can also be used when updating the software/features of the X10(S). The X10(S) can play back WAV (Waveform Audio Format) files stored on it's SD-Card. You can easily add custom sound files of your own. Just like having a copilot, the transmitter will give you voice alerts on speaker or through the headphone jack. Count down timers, low voltage warnings, landing gear down, thermal mode entered, etc. can all be set up with a human recorded voice of your creation, or sound packages shared online from other hobbyists. The X10(S) also offers vibration as an additional pilot feedback for alarms, etc. The battery is Li-Ion 7.2V 2S with 18650 cells and a capacity of 2600mAh. The AC adapter has a 15 volt 1A DC output. The charger is built in, the adapter plugs directly into a round barrel connector on the radio. The X10 gimbals have a metal mounting frame, plastic mechanics (with metal crossbars), 4 bearings, and Hall Effect sensors. The X10S gimbals have CNC milled aluminum rotating parts and frames, and are equipped with 10 ball bearings in each unit (two on the return to center mechanism) with digital Hall effect sensors, for a superior quality feel, durability and even more precision. The stick lengths are adjustable. There are two connectors on the main board for analog and switch input from stick ends. The X10(S) has three different types of Failsafe, to help you recover your airplane should you experience a loss of control signal to the receiver: simply holding the last received positions, turning off pulses (for use with flight controllers having return-to-home GPS on loss of signal), or moving the servos to custom predefined positions. The RSSI feature means you probably won't ever use the failsafe. Your X10(S) warns you when the received signal strength is becoming too low, allowing you to correct the situation before a loss of signal. The open-source software for the X10(S) has been developed by hobbyists for hobbyists in the R/C community. The programmers of the transmitter firmware and companion PC software which runs on Linux, Windows, and Macintosh are very receptive to input and requests from users. There are no limitations based on marketing decisions. If you can think of it, chances are the X10 is capable of doing it. With 60 model memories, tons of mixes, 9 flight modes, sequencing, servo speed, programmed delays, all kinds of triggers, and the ability to assign any channel to anything, it is hard to come up with something this radio can't do. A nice feature of the radio is the ability to connect to a PC via the USB port, allowing you to move files between the PC and the radio, including telemetry data files for analysis. The X10(S) has a normal JR style module bay on the back that will accept modules for other transmitting protocols, including Futaba, Spektrum, and JR. The external bay also allows you to add another FrSky module to your radio, giving you a total of 32 channels if you use the eight discrete channels and eight serial SBUS channels available on each module. SBUS is a type of serial communication protocol that allows you to utilize servos specifically designed for SBUS operation and supports multiple channels using only one daisy-chained signal cable. • Li-Ion battery 7.2V 2S with a capacity of 2600mAh. • The AC adapter supplies 15VDC @ 1A, but the radio may also be charged from DC 10~18V, with input power no less than 13.5W. • Current drain: 350mA maximum @ 7.2V (both RF power and backlight on). • Trims - Adjustable from coarse to extra fine with extended and exponential trim options. • High Resolution color TFT (480*272), readable outdoor. • X10S gimbals: CNC machined frames, equipped with 10 bearings to soften the friction, digital hall effect sensors and extensible ends. • Two additional freely assignable trim switches. • Training port compatible JR/Graupner DSC radios. • S.Port Connector for upgrading receivers etc. • The Mini USB port, S.Port and trainer port are protected from dust and moisture with a rubber cover. • SD card slot for system expansion. • Recessed system reset button underneath radio. • Power on button with 3 color status LED. • 2 finishes to choose from between amber and silver. • 3 finishes to choose from between carbon fiber, amber and silver. • Black semi-rigid cloth covered zippered carry case with the FrSky logo embossed in the side. The case includes plastic gimbal protectors that cover the sticks for transport.